Yesterday I visited a Christian book store and discovered a very recent addition to the ESV lineup of Bibles: Global Study Bible [GSB] (2012). This review is an initial impression of the GSB, not of the ESV translation. Its excellence, beauty, and value. Helping people everywhere to know and understand the Bible, the gospel, and Jesus Christ as their Lord and Savior. And addressing life-and-death issues of truth and justice, beauty and righteousness—facing individual Christians, the global church, and communities of people everywhere around the world. As an initial view on the GSB, these are not only laudable goals, but seem to be achieved with its publication. I had passed by that stand several times, not really wanting to look at ESV Bibles; although I admit I am fan of having many Bibles, including the ESV. But I already had three different style ESV Bibles. But then the title of the Bible seemed to call to me: “What is a Global Study Bible?” I didn’t find it pretentious at all. From my 30+ years of church service, I have always leaned toward the missionary side of church, both local and international. So I assumed that it was some kind of mission related Bible. And it is, but also more. With the purchase of the GSB, the person then has access to the identical Bible online. I registered this morning and saw that it was not only the same, but it gives the user the ability to take notes. So, this seems to be a good blend of traditional print material as well as developing technology. Another benefit of registering online is this will allow a second person to receive a copy as well—free! The person receiving it will be “another Global Christian, wherever the demand is greatest, anywhere in the world.” Now that is an excellent approach to distributing the Word of God! Sometimes “give aways” are for those within the same realm (i.e. North America); but here Crossway determines where the greatest need it. I like this very much! Well done! I like maps! Maps are essential in teaching, reference work, and personal study. Well done maps are a great aid in teaching. Poorly done maps are discouraging at best. Sadly I have found Bible maps often disappointing: colors clash, colors too flashy, font choices are wrong style, size, and even color. Topographic features tend to overwhelm data on the maps. You get the idea—I am very critical about maps. The GSB maps in the back (15 color maps) are the best quality I have seen in study Bibles without exception. The color combinations are clear but not overwhelming nor conflicting. Even the topographic elements do not overshadow the text and boundaries. The fonts used on the maps are excellent: the right size and style of font, Regions are bold, capital letters, cities are smaller, italic (but very readable italic). The maps are easy to read, understand, and use. 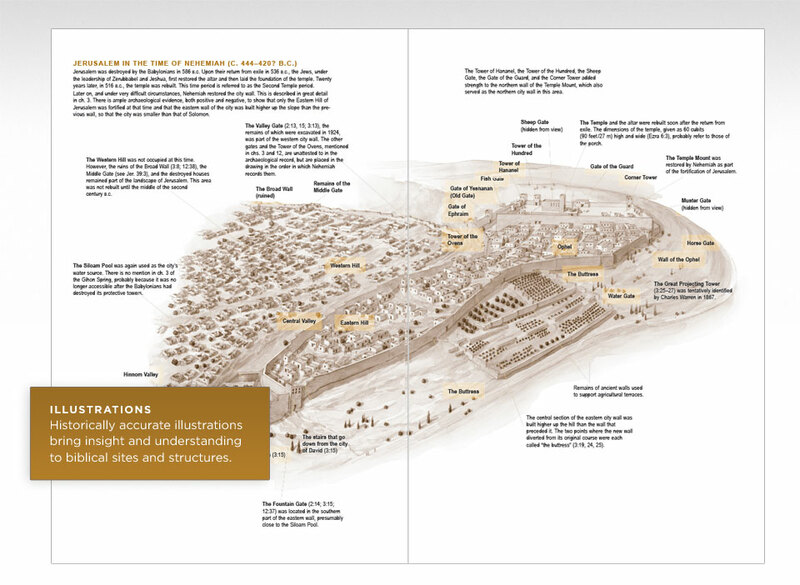 GSB includes another 119 maps that are spread throughout the text of Scripture. I like the two-tone colors of the maps (black font and outlines, faint beige for shading and caption backgrounds). The only negative is that there is slight bleed through, but still legible and useful. In comparison, the in-text maps in The Lutheran Study Bible (by LCMS) are much harder to read because of the bleed-through and the font choices. For many people, font choices don’t matter much —until there is a problem. In the GSB font choices make the difference between borderline acceptable choices and useful choices. The challenge is to provide as much information on each page as possible without overwhelming the reader. The text of Scripture itself is usable. I would prefer a slightly larger font, but that would require a larger format for the entire Bible. The specific font is easily readable. The cross references are a little too small for my older eyes. Also, the study notes at the bottom, while a little larger than the cross references, are a little too small. Again, passable but not ideal. Considering the size of the Bible itself and the volume of information packed into it, the trade off on font size means less than ideal conditions. But as I have begun reading this in the last two days, I find the text itself and the study notes acceptable; the cross references require effort to see clearly (and yes, I have recently had my eyes examined). Like the “Names of God Bible“ (using God’s Word), the headings and highlights are in a subtle tan color that works well in this type of Bible. It draws attention to the headings, but does not distract from reading the text itself. The same color scheme is used in the “Fact” blocks of text (there are 900 hundred used throughout the Bible) and for the maps, as well as simple timelines at the beginning of each book. I like the timelines placement, and the color separation. It becomes an easy reference to find. Bleed-through is minimal, so they are easily read at a quick glance. 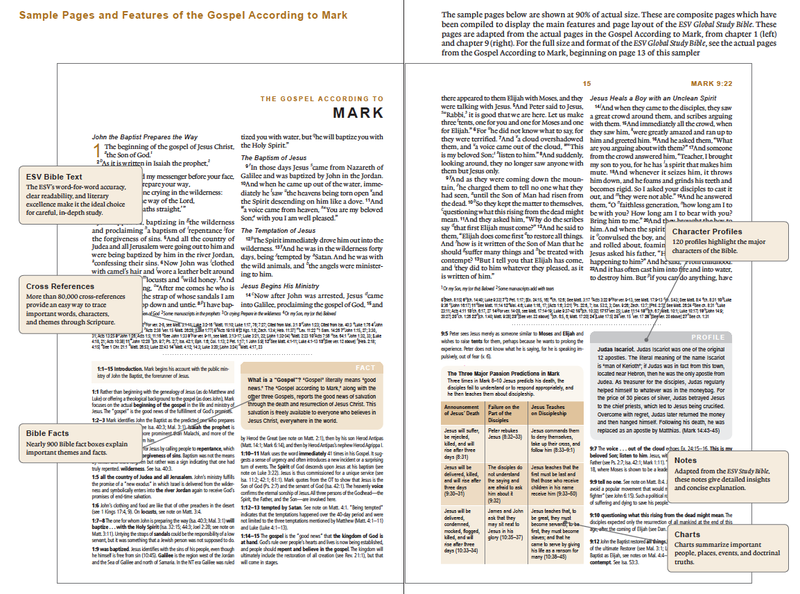 Pages numbers (centered at the top), Scripture references (outside margin on the top), and large Chapter numbers also use the darker tan colored font. Each is easy to find, easy to read, and does not dominate the page. Overall for font choices: excellent, and a very pleasing affect! Some times these additional aids actually become a stumbling block: either too much detail, or too small print or not enough detail. Finding the right mix for study and teaching purposes is difficult. GSB editors have done an excellent job in this regard. The additional resources in terms of charts/diagrams (119 total) and illustrations (36 total) makes this a very useful study tool. The color scheme (see above) and the detail in each case is enough to understand the chart/diagram or the illustration. As one who draws many of charts/diagrams free hand for class purposes, these make an ideal complement for my work. There are 120 Character Profiles scattered throughout the text of GSB. 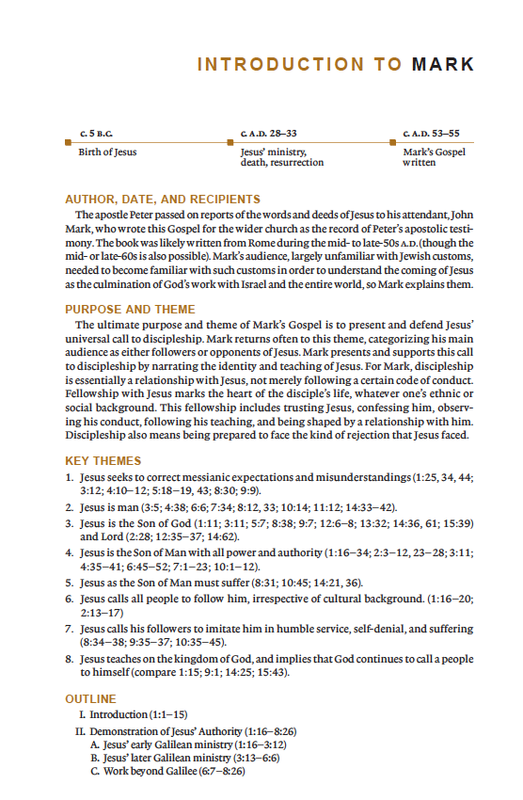 These are one paragraph to give an overview of the person, including a few pertinent Scripture references. Given the nature of this study Bible and the limitations of space, they seem appropriate to be the right length, just enough to get a sense, with the help if further study is desired or needed. These are highlighted with a faint grey background to easily distinguish it from the Fact boxes in the text (see pp. 82-83). Both introductions were direct, concise, and easily referenced. Although I have not read all of the Global Message introductions, I have read enough to realize that they have given me pause to consider the global implications of the text; food for thought in a global context. And this is good for students of the Bible! 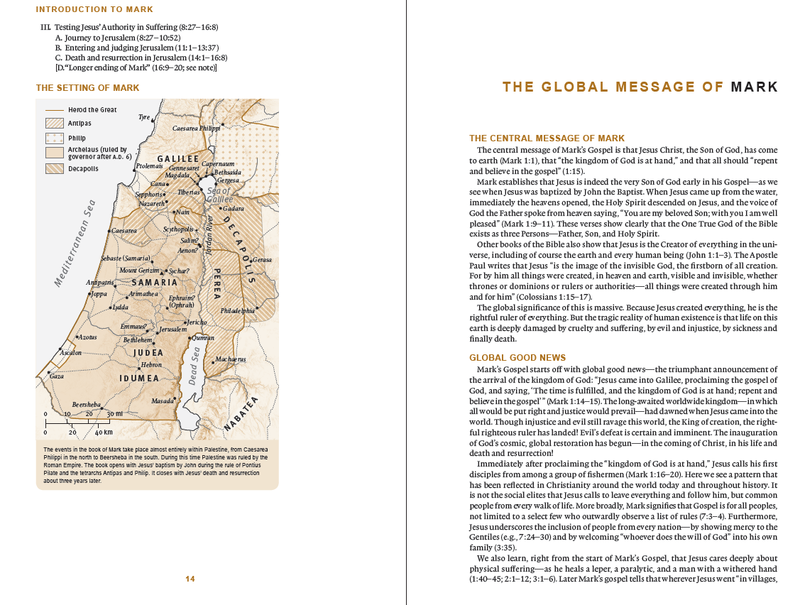 Except for the size of the font for the cross references, the Global Study Bible is a winner. The font choices, the color combinations, the maps, chart/diagrams, and illustrations are superb. This is an excellent resource for study and teaching. In fact, I used it last night for teaching Bible class to see how it would work for me. Very convenient, and usable in that environment. While not theologically up to the caliber of The Lutheran Study Bible (ESV) produced by Concordia Publishing House, the Global Study Bible is actually more useful in a quick reference situation and extended study because of the above mentioned features. what is the different of global study bible and study bible (produced before) of ESV ?? Howdy. Thanks for stopping by. I don’t have the “generic” ESV Study Bible, so I can’t comment on that. I do have the Lutheran Study Bible (LSB) which uses the ESV translation. In terms of study material, the LSB is by far more extensive, including book introductions, timelines, text and theological study notes. So, if you are looking for comparisons regarding material available for further study, LSB is the choice. However, the GSB is not really meant for detailed study in that same way. Thus the book introductions are handy, easily identified, and good for quick reference. Likewise, the study notes on the text are minimal at best. The GSB’s main advantage is the inclusion of mission related articles on the books of the Bible; LSB does not have any thing like this. The GSB also has much better layout. Thus, they really are two different kinds of Bibles. It seems almost a misnomer to call GSB a study Bible, rather a mission oriented Bible would be more accurate. The GSB is an abridged edition of the ESVSB. In fact, it’s essentially a repackaged ESV Student Study Bible with a handful of new essays. Considering that the standard study bible is practically a one-volume commentary, the SSB and GSB are actually better options for most readers–the notes have been stripped of their excessive theological rambling and just get to the point.